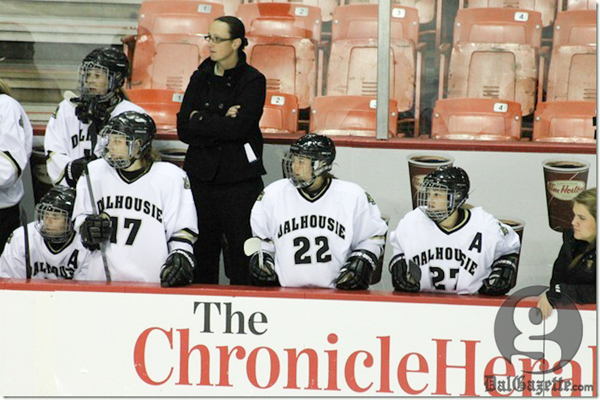 The 2012-2013 varsity season was an eventful one for the Dalhousie Tigers. There was the hazing suspension for women’s hockey and an ongoing investigation into the men’s hockey program which brought negative publicity to the school, but the successes were many for the black and gold. The Tigers won six AUS banners, David Sharpe picked up three Canadian Interuniversity Sport medals in swimming, while women’s teams ran away with four titles. Gold rush or fools’ gold? While six AUS banners may be a tad lower than the usual average, director of varsity athletics Karen Moore looks back on this season with a positive attitude. Moore looks to their women’s volleyball team as a role model for other squads. The team that surprised Moore the most was women’s swimming. They finished fifth in the country after another impressive AUS schedule. Moore attributes a below average number of titles on the youth of the majority of Dal’s teams, but says there is no need to worry. She insists that patience is the key to competing, especially in the competitive environment of the AUS. Dal dominated the women’s side of the AUS with four titles–half of the eight banners the conference doles out yearly. The Tigers handily won championships in swimming and track and field, claimed back-to-back titles in Soccer and added their first volleyball banner since 2005. Moore sees the success of Dal’s women’s programs rooted deeply in the equality afforded to their athletes. “Even when I was an athlete back in the ’80s, I always felt we were treated equally. We had everything the men’s programs had,” she says, nothing the only real difference is when some of the high-profile men’s teams receive larger donations. The strong academic performance of their student athletes is something else the university is proud of, able to boast the highest record in the AUS with 96 Academic All-Canadians this year. One of the biggest struggles facing Dal’s athletic program is the state of the athletic facilities. Gone is Memorial Arena, leaving the outdated Dalplex as the university’s crown jewel. This begs the question: when will students see the upgrades they have been clamouring for? “Currently, we’re facing significant challenges, Dalplex was built when we had 8,000 students and we’re now at 17,000. And the arena being knocked down has had a huge impact on our hockey teams. “We know the challenges facing athletes are tough, and this year wasn’t ideal. At least we know that next year the women’s hockey team will have a home,” she says. The resurgence of Dal’s much-discussed women’s hockey team following the January suspension of all 17 non-rookie players for hazing will see the Tigers at the on-campus rink of Saint Mary’s University this fall. Before their penalty, the team played in various HRM arenas and was scheduled to play New Glasgow for the second half of the season. Moore explains a renovated Dalplex and a new fitness facility to complement the gym is a few years away. Despite winning six AUS titles, the Tigers failed to make much of an impact on the national stage and left mostly empty-handed for medals: three in swimming and two courtesy of track and field. “Our coaches have had to be creative to recruit, and they’re fantastic at what they do, but we’re hoping new facilities will help grow our programs,” she says. Moore also sees the higher schools per capita in the Maritimes as a challenge. There’s more funding available for the fewer schools out West, she says. One of the biggest obstacles for Dal Athletics to overcome remains the finances, including the $17.5 million shortfall Dal is making up for its next budget. Trying to maintain all 14 varsity programs has been difficult, says Moore. The department itself has four less full-time staff than it has in the past, including the unfilled athletic director position that oversaw the entire program and the previous fundraising position. This varsity season also saw an emergence of a higher profile varsity council, a group of student athlete leaders who help organize events and are involved in the community. Moore says it has helped bring the various teams together, alluding to a fun varsity relay challenge that was put on at the Tiger Track Classic and the new program where Dal athletes have united with Special Olympians for an afternoon of sport. Moore was unable to comment on the ongoing Canadian Interuniversity Sport investigation into Dal’s men’s hockey team, which is believed to be about inappropriate financial awards, but she explains the turmoil is over for women’s hockey. The program will be back on the ice next year. “The biggest impact of the women’s hockey season being suspended will be on this year’s players, but honestly, the coach [Shawn Fraser] is out recruiting and already has about 10 recruits confirmed for next year. The university is also in the process of establishing a more comprehensive hazing policy that covers all students not just athletes. Looking forward, Moore firmly believes in the importance of athletics in the university’s vision. “If you look at the kind of exposure we bring in through athletics compared to any other part of the school, the value of that is unbelievable when you think of what it would cost to get that kind of advertising.